In Como Lake tapestry we see a panorama of the lake and hillside houses from a tall tower. Here we see the curved arches of this high vantage point to overlook the Mediterranean water, and the red roofed houses and villas perched on the hillside. There is a climbing flowering plant on the porch. Lake Como, because of its beauty and serenity as well as its pleasant weather, has been the haven for poets, writers, musicians and philosophers over centuries. 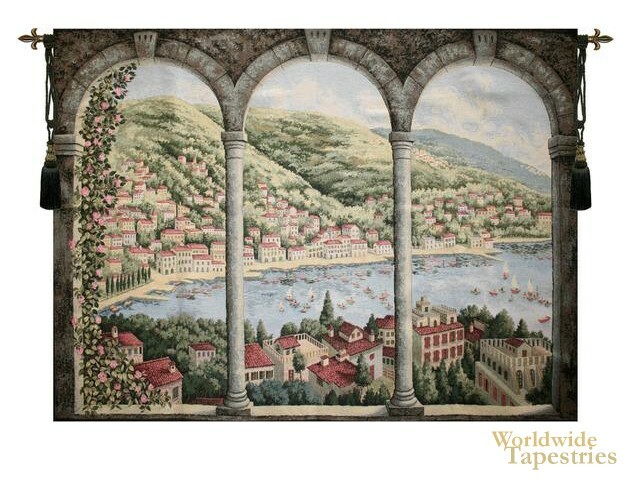 This Como Lake tapestry is backed with a lining and a tunnel for easy hanging. Note: tapestry rods and tassels, where pictured, are not included in the price.